Project: Yorba Linda Town Center - View Our Work In Action! Working with businesses, individuals and the city, SoCal Removal is demolishing a number of 95 to 105 year old homes while salvaging home fixture items of historic value. SoCal Removal was selected by the city of Yorba Linda to join a job walk because of its excellent project management skills as well as satisfactory licenses required to complete the demolition. Well versed in project management, demolition, general construction, hazardous materials asbestos removal and lead abatement the organization offered the expertise needed for the project. Before heading to the site, Andre took a few moments to describe So Cal Removal’s involvement and the massive project. Lucky to catch him! Question: Give us a rundown on the number of homes and the sizes. Well the first phase of the demolition consists of demolishing five city owned homes as well as 1 developer owned lot that contains two structures. The lots contain trees, driveways and miscellaneous debris that are required to be cleared and grubbed. 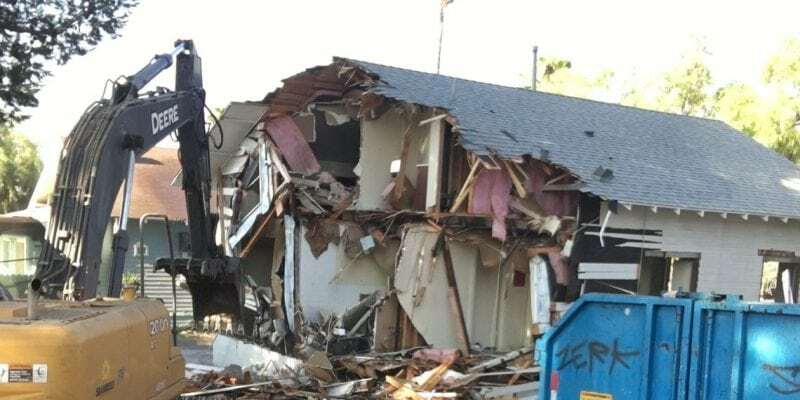 SoCal Removal is continuing to make progress on the demolition of historic homes in Yorba Linda. According to Andre Abajian, Owner of SoCal Removal, the demolition project involved a city block of homes over 100 years old to make way for this new and highly anticipated outdoor mixed use shopping center development. Currently, SoCal Removal is finalizing the demolition and land grubbing and site clearing for development of the Yorba Linda Town Center. The demolition is to prepare for construction of a several large buildings and structures which will house new tenants. A Bristol farms grocery store and Regal Cinemas plan to occupy. The development will also consist of a 460 capacity – 4 story parking structure to be built by Bomel Construction. There are future ideas and plans which would involve the OCFA Station #10 to be possibly relocated. This fairly aged and exhausted station relocation would allow improved accessibility and more use of precious real estate. The newly built parking structure will have the ability to be expanded onto the area in question. Andre Abajian and SoCal Removal have made tremendous progress on the Yorba Linda project. Thus far, Andre has finished the demolition of 7 homes of historical value and structures completing the project’s first phase. Next he will continue to clear lots of land which will house the dirt import to bring the block up the street level accordingly. The most recent demolition was a 101 year 950 sq. ft. home. Fellow locals found several items of value which SoCal Removal was able to salvage. The front pillars were of interest to some town locals. Surprisingly the galvanized steel roof from a back structure was also sought after as well. According to Andre, the roof had an aged, special colored weathered look that was unique. The last item of value was the pressed hardwood on the front porch. Scheduling the inspector/estimators/haulers/crew and heavy equipment rental companies is an exercise in time management. Andre stated there at times there was only a half hour to schedule an appointment, between 7:00 and 8:00. At that time the Inspector will give you a one hour window to verify a time they would arrive so you do not have to wait all day. Being proactive which appointments allows greater use precious time. Should you miss the call time, you simply wait. Chances are you’ll be the last appointment of the day but you don’t know. Obviously Andre sees room for improvement in this scheduling process amongst hundreds of other areas in the construction and general task related demolition and or construction arena. SoCal Removal may place a call on Friday and was scheduled for Wednesday. A situation as this basically puts a project on hold for three business days and potentially the long weekend. The next phase is to fill a 4 and a half foot hole that was dug in order to cap a sewer lateral line. Luckily the depth did not exceed 5 feet which was critical to prevent the need for potential trenching. Once the dirt is filled in it will have to be compacted properly which either a backhoe or an excavator. SoCal Removal is anxious to continue working on the next phase of the massive project. As a licensed General Contractor, Andre proudly states that he can do “several trades”, can contract with others and realizes it is a wonderful opportunity. Along with other projects in the area Andre has every intention to pursue any additional construction and demolition work. SoCal Removal is now familiar with the area and the project requirements. He feels confident in his ability to provide value as it progresses. Whether you need to renovate an entire city block like Yorba Linda or need to demolish and renovate your home, SoCal Removal can provide the service and care you need. Call SoCal Removal at 949-446-0000 for a personal conversation with Andre to discuss your current construction plans. Andre will be the individual who returns your call. What are the new plans for the site? The vision to create the Yorba Linda Town Center begun nearly a decade ago. The neighborhood was one of the first in the city so naturally much comes into play when redeveloping a residential piece of land into a full scale desirable shopping center to attract consumers of all kinds into this area of Orange County. What other businesses are involved in the project? What role do they play? SoCal Removal is currently working with Zelman Development in assisting them with the demolition of several historical bungalows to make way for a rezoning of the entire area. How long ago did Yorba Linda begin plans for the revitalization? Plans to renovate this entire block which will consist of over 125,000 sqft of building space. The development will also include a 1 acre park in the middle as well as over 600 parking spaces. When did your involvement begin? My involvement began on March 29th 2016 when I took my first walk onsite. The first step to demolition is obtaining hazardous material surveys, erosion control reports, determining the cost of demolition, several months of coordination with insurance companies, historical societies, buyers of historic items, city personal, developers, heavy equipment rental companies as well as debris removal and hauling. How many demolitions has your business done? What stage do you enjoy the most? SoCal Removal has completed numerous amounts of demolition projects of all sizes throughout the southern California region but primarily Orange County. As for myself, I have been in the construction industry since 2005 and nearly every project I have associated myself with included demolition of some form or fashion. What equipment will be on site? Preferably all American made equipment as we focus on making American Great Again! 30 Ton excavator with a thumb will be used, skid steer, back hoe, debris containers provided by Yorba Linda Republic Waste services, sledgehammers, fire hydrant tools, dust control, gravel bags, jack hammers, stakes, caution tape, portable toilets, gas powered chain saw, ford trucks. What is the biggest obstacle you faced thus far? How was it resolved? Is this your best take away from the experience? The biggest obstacle is the insurance requirement which is 10,000,000.00 aggregate liability insurance for this project and being able to obtain a performance bond for the contract amount. On the other side, what went surprisingly well? The city of Yorba Linda has been absolutely supportive of the efforts we have made so far. They are quick to respond to my questions or concerns for each and every step of the way. What is your biggest fear as the demolition progresses? My biggest fear is the risk of personal or team member injury. Safety first! With such historic homes I’m certain there is a great deal of interest to insure items are properly salvaged. Who has been involved in making the determination and assessing value? Any surprises on the items found? Unfortunately, I haven’t found a suit case full of money yet nor a dead body, thankfully! You just never know what you’ll find when dealing with larger demolition projects. If all goes well, how long will the process take? If disaster strikes? If all goes according to plan I would expect the demolition to be completed during the month of August of 2016. I anticipate the lead abatement to be completed by July. We can begin Yorba Linda Town Center demolition tasks as early as late July of 2016. What future involvement in the project would you like to have? I am not working with the developer on clearing some large tree’s as well as their roots and surrounding gravel bags to make way for a large stockpile of dirt which will be used most likely for grading of the area. The developer does not have approved grading plans yet but as soon as they do I would be honored to give them a bid for the rest of the work. Next is a meeting with utility vendors of 8-11 Dig-Alert tomorrow at the site around 10am. From there we will detect all overhead and underground utility lines before demolition of residential historic structures and removal of the trees.